The job of a deputy sheriff is never routine. The night of January 18th is a highlight of how things seem normal but can quickly turn into a more significant investigation. Deputy Justin Arters observed a vehicle violate a simple traffic law. The driver failed to make a complete stop at a stop sign. Deputy Arters then attempted to stop the vehicle by activating his emergency lights to signal the driver to stop which prompted the driver to elude him. The driver abruptly turned into a private drive and came to a stop. Deputy Arters saw a tall black male hastily exit the passenger side of the car and run from the scene. This person, whom we will call “the runner,” left the driver to deal with the consequences. Deputy Arters identified the driver as Rebecca Carter (1-27-94) of Williston. Ms. Carter had a valid driver’s license and was not wanted for any outstanding warrants. However, Deputy Arters had already seen two guns in the floorboard, a clear glass canister with a green leafy substance inside (it also had a marijuana sticker on it) and a black box which had a plastic baggie hanging out of the closed lid that contained a white powdery substance. With these “clues” Deputy Arters began his follow up investigation. Ms. Carter denied knowledge of a passenger and claimed ownership of all items inside the car. Deputy Arters located and seized more than he initially anticipated when he searched the car. The substance in the glass jar was exactly what the sticker indicated it was, marijuana. The two guns seen on the floor board were collected and determined to be a 9 MM and a BB gun made to look like a modern firearm. 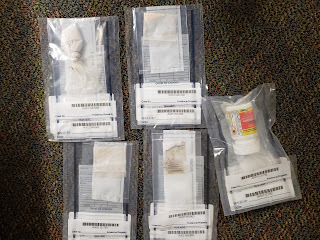 The black box held used syringes, an unidentified substance suspected to be Fentanyl and the white powder in the baggie protruding from the lid was identified as heroin. 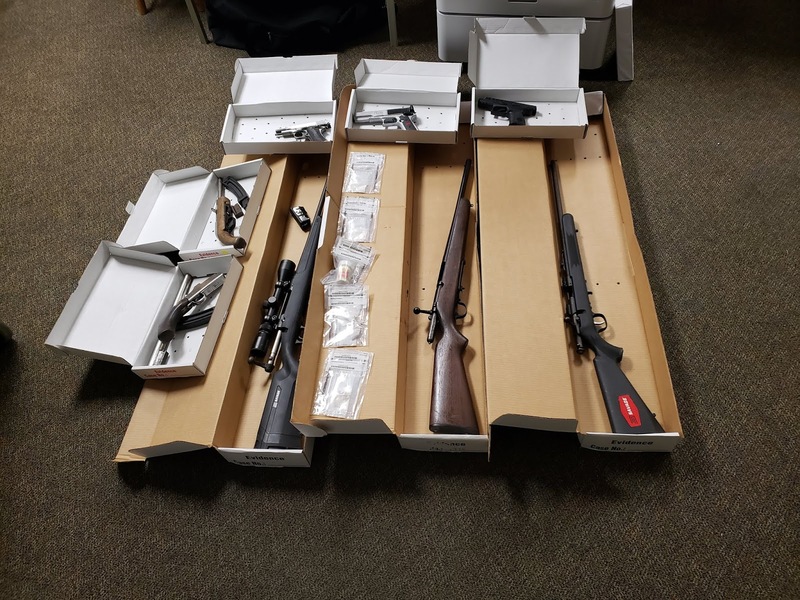 Deputy Arters searched further and located six more guns, two shotguns (one was sawed off), three rifles and one BB rifle. An assortment of ammunition and high capacity magazines (clips) was found in the same area of the vehicle in which the guns were located. Ms. Carter was arrested and transported to the Levy County Detention Facility. 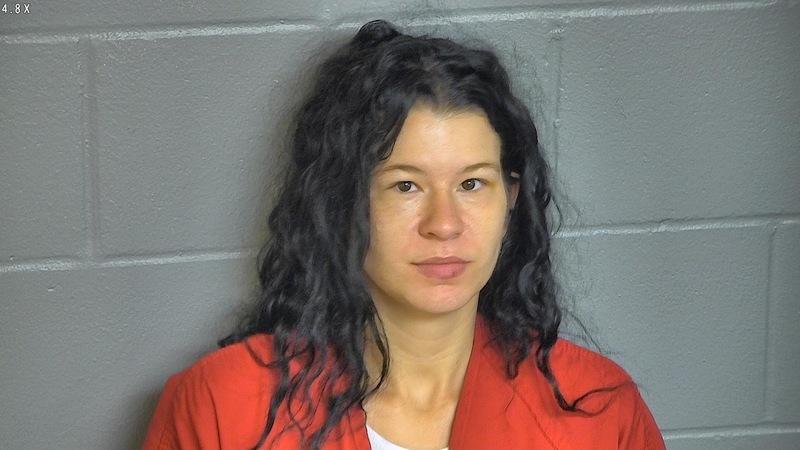 She has been charged with trafficking in fentanyl (positively identified with a presumptive test), possession of heroin with the intent to distribute, possession of drug paraphernalia and possession of a short barreled shotgun. She remains in custody in lieu of a $250,000.00 bond. This investigation is currently on-going. Deputies expect the “runner” will be identified in the near future and charges could be filed at a later date. 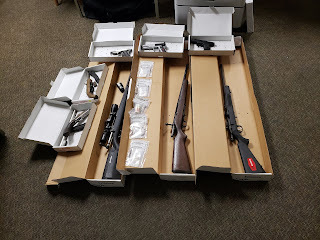 In the end, dangerous drugs and guns were removed from our streets and our community can rest that much easier. Deputies patrol our streets 24/7 and simple infractions such as this are not always routine.